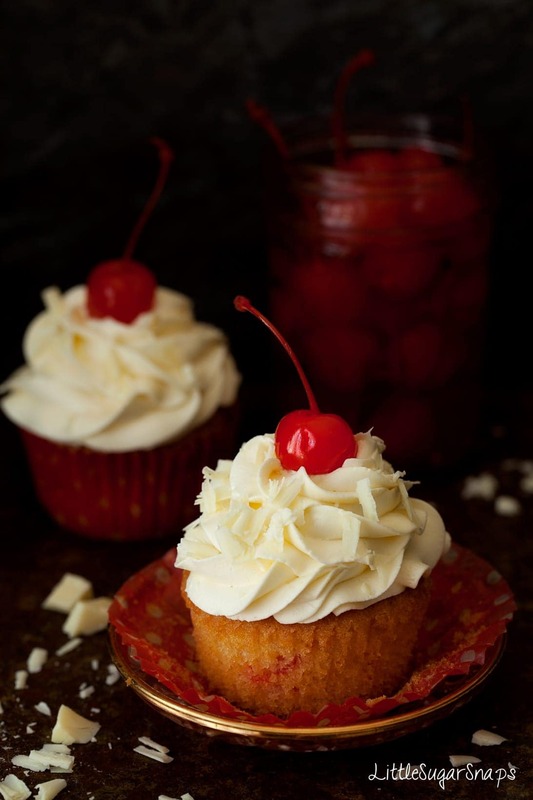 Maraschino Cherry Cupcakes with White Chocolate Buttercream are exceptionally smart but easy to make. Appealing to all ages and perfect for any occasion worth celebrating. This week marks a milestone in my family life. My older child leaves primary school. That event, which is now only a couple of days away, fills me with a great many emotions. The last 7 years have been more than good for my daughter. When she leaves her school for the last time on Friday she comes out armed with firm friends, happy memories and a positive attitude towards the next stage in her life. I come out with a bunch of extra friends too. Along with a slight feeling of annoyance that those primary years are over so swiftly. I clearly recall the first day we took Hannah to school. All of the year 6 kids looked so big and their parents, well, they were veterans (aka much older). I felt inexperienced, slightly green at the edges and a little tearful at the sight of my daughter marching into school so happily. Of course, 7 years later and now I’m the veteran. An occasion such as leaving primary school should be celebrated. It is a milestone in life. And what better way for a bunch of kids to celebrate than to make a lot of noise and eat cake. Lots of cake. Tomorrow I’ll be heading to my kitchen to produce a vast quantity of chocolate and vanilla cupcakes for the grand finale: the 2017 leavers party. So it’s only fitting that this week I serve up cake on LittleSugarSnaps. These Cherry Cupcakes come speckled with finely chopped Maraschino cherries within the sponge, along with a lip-smacking swirl of white chocolate buttercream on top. To finish things off, I’ve topped each cake with a little grated chocolate and the crowning glory, a whole Maraschino cherry. Despite their smart appearance, these Cherry Cupcakes are very easy to make: it’s a simple sponge cake recipe with the cherries added in. I was almost tempted to use vanilla buttercream, but in the end I couldn’t resist taking that extravagant plunge and opting for a white chocolate version instead. White chocolate and cherries seem to work in harmony. The overall effect is one pretty cupcake. The flavours will appeal to children and adults alike. 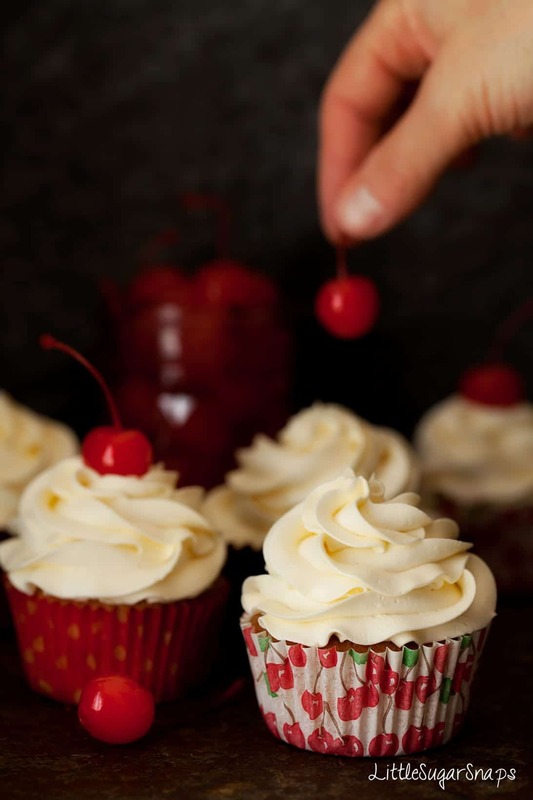 And let’s face it, who could resist a cupcake with a Maraschino Cherry on the top. So here’s to all kids about to embark on the next chapter of their lives… and their veteran parents. Just printed your recipe! Maraschino cherries and white chocolate buttercream? I’m in heaven! Plus they look gorgeous! I know I will have the occasion to make these! Thanks for sharing! Thanks Marcellina. Hope you enjoy them soon. In fact it’s the weekend nearly, which is cause for celebration in my book. What a great recipe! I love the white chocolate buttercream! Beautiful! That white chocolate buttercream frosting is swoon worthy! Thanks Linda. I was eying up a little spare buttercream that is sitting in my fridge just today and thinking of cookie sandwiches it could work in. LOVE those little pops of cherries throughout the cupcake! These are really beautiful and I bet they taste terrific. Congratulations to your daughter! What a big step and it’s wonderful she has such a great attitude. Thanks Tricia. And I just hope she keeps that positive spin right through life. Congratulations on your daughter leaving primary! My oldest child is starting kindergarten next month. These cupcakes look gorgeous! I love that buttercream on top. Thanks Tara – and good luck to you and your child for next month! These cupcakes look darling – and I love those cute wrappers, too! Congrats to your daughter and best of luck in the new phase. My son is only two and I’m already wondering how it could possibly go by so fast, so I can only imagine it gets more mind-boggling as you go! I remember the moments my son started his kindergarten, and now he will be in 4th grade. How time flies so fast, the next thing you’ll realize, they’ll be heading to college. You are so right. Let’s not blink too much for the next 10 years. These are such beautiful cupcakes! Thank you for this wonderful, yummy recipe. I made these cupcakes for Valentine’s Day for my husband. They were a big hit and oh so delicious. The batter only gave me 8 muffins but no worries – there are only two of us, so we surely had more than our share. The buttercream was, as the saying goes “The Icing On The Cake”, so very decadent. Thank you so much for sharing your recipes. Oh, so pleased you enjoyed them – they are a lovely bake for Valentines with the bright red cherries in them. I wonder if you have bigger pans than me – muffin tins might well be a little larger than my cupcake tin. Either way, a larger cake is never a bad thing! Thankyou so much for taking the time to let me know how you got along – it makes my day.